The Meath West TD is suspended from Sinn Féin after voting against the abortion bill but he insists he wants to rejoin the party in January. PEADAR TÓIBÍN, THE Meath West TD suspended from Sinn Féin since last July, has said he wants to rejoin the party next month, but has confirmed an approach from Fianna Fáil. The currently independent deputy was suspended from Sinn Féin last summer after he voted against the party position on the Protection of Life during Pregnancy Bill. Tóibín claimed yesterday that “two senior representatives” in Fianna Fáil – which recruited Colm Keaveney to its ranks last week – approached him in the “recent past” about joining the party but he refused. Fianna Fáil did not immediately respond to a request for comment. “I told them I wouldn’t join them because of major policy differences,” Tóibín told TheJournal.ie this morning, dismissing a report in today’s Irish Independent that he has told supporters he will quit Sinn Féin altogether amid a dispute over Gerry Adams’s response to the Smithwick Tribunal report. Tóibín insisted this morning that his analysis of the Smithwick Tribunal report is “at one” with that of Sinn Féin. There could be issues around the date of rejoining because of a vote on a private members’ bill on abortion, tabled by independent TD Clare Daly, which is due to be held in late January. Tóibín is strongly pro-life and has previously said the abortion legislation passed last July is not based on medical evidence. He has also described the Supreme Court decision in the X case as “historic and archaic”. But despite being at odds with the Sinn Féin position on abortion, the Meath West deputy said this morning that reports that he was preparing to quit the party altogether are “inaccurate” and “frustrating and tiresome”. Email “Peadar Tóibín: Fianna Fáil approached me, but I want to rejoin Sinn Féin”. 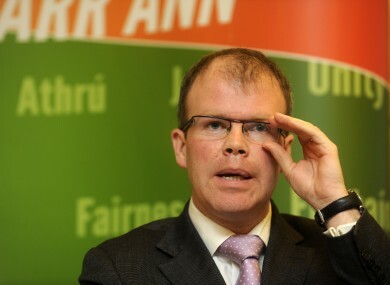 Feedback on “Peadar Tóibín: Fianna Fáil approached me, but I want to rejoin Sinn Féin”.